Discussion in 'Server Announcements' started by KingGoldensPanda, Dec 30, 2018. What my favorite thing on the server is: Being #1 in baltop also the floating islands that are in the hub, they’re great inspiration for my own island! 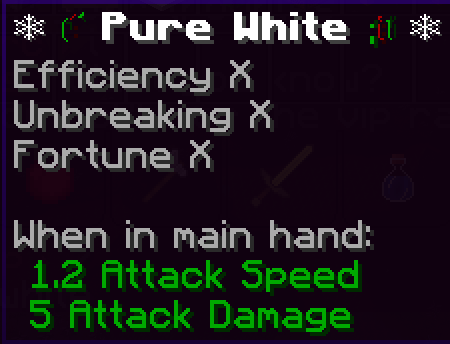 Hi everyone, In celebration of the best year the server has ever had, I'm giving away ONE pure white pickaxe. This pickaxe is extremely exclusive and only available around Christmas time each year. You can choose to have it on Skyblock or Survival. If you like Prison the most over Skyblock or Survival, you may choose to have a 12 hour 5x mining multiplier on prison instead. The winner will be chosen at random within 30 hours! To enter, answer the following format under "CODE" in a comment that you post below. Include the questions in your comment.. Good luck. Rules: You can only submit one comment. You must use the format below to be qualified to enter. What my favorite thing on the server is: The economy on skyblock. I love the idea of it and making money to make island look good. It's also fun to see what can sell the most and what doesn't. Finally, people are also very friendly on here and will help you out. What my favorite thing on the server is: I really like that everyone is incredibly nice, and if you ask for a favor then people will help you. And the best is that no-one is rude to anyone else. Favourite Thing: is the community, the players and especially staff are always helpful and there for the server and when they need, the players. There's generally always at least one of them on, whether its a trainee or moderator, this constant coverage is why the system is great on this server. The people and staff are generally so friendly and easy to talk to. What my favorite thing on the server is: The fact that griefing is not allowed and that there is always staff online who help people and punish rule breakers. What my favorite thing on the server is: Everything in the server. I have no special thing that make something favourite. I like all the players and the community to make playing on the server possible <3. What my favorite thing on the server is: The community. I love being part of a place where people are friendly and I feel welcomed and part of the group. For someone who doesn't ever feel that way it's very very nice. What my favorite thing on the server is: The active community. What my favorite thing on the server is: The player base is nice and friendly. My favorite Thing about royal legacy is it’s community, I am not as active anymore but I go on every once an a while and catch up with people. It’s very cool to see how the community has changed with people coming and going. Royal legacy is the best server I have ever played on and I’m happy I found it.